A spirited rally was held Wednesday by CODEPINK and its allies, on the steps of the U.S. Justice Department, in Washington, D.C.
Its purpose was to protest that three of its members were recently found guilty of disorderly conduct by a court in the District and each face a possible sentence of a year in jail and a fine of up to $2,000. Keep in mind, that U.S. Sen. Elizabeth Warren (D-Mass) was barred from reading, at Sesssions’ hearing, a letter from the widow of Rev. Martin Luther King, Jr., (Coretta Scott King), which had sharply criticizing Sessions on his Civil Rights record. CODEPINK is a national organization working for Peace and Justice on a wide array of issues. It is known for conducting demonstrations, but always in a peaceful and nonviolent manner. The fear, as expressed by some activists, is that the Justice Department under the Trump-Pence regime may go out of its way to “crackdown on dissent, especially in the form of nonviolent protests.” In the past, they added, charges would not have been brought in this type of situation. Trump is well known to be very thin-skinned about any criticism directed his way. 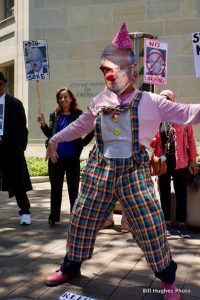 One of the defendants, Tighe Barry, appeared at the rally, as Attorney General Sessions in a clown outfit. His antics mocking his arrest brought a lot of laughter from the demonstrators. The sentencing hearing for the three defendants is set for June 21, 2017, before the Robert E. Morin, Chief Judge of the Superior Court of D.C. 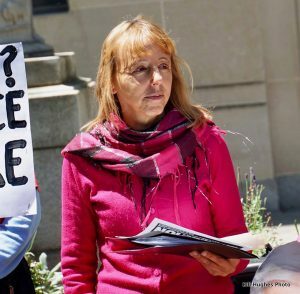 Speaking at the rally was Medea Benjamin, co-founder of CODEPINK. She expressed her concerns about the status of the three cases and how justice wasn’t served by the jury’s verdicts. Her remarks can be found on Vimeo.